On Wednesday, the world lost one of the most pioneering, brilliant, inspiring minds in economic history. We've seen numerous articles about the life of Steve Jobs, but here at L&A, none says it better than the man himself. Please follow the video link below to watch the always inspiring and insightful speech that Mr. Jobs gave to the very lucky Stanford Class of 2005. Mr. Jobs was one of the greatest business and creative geniuses of our time. The implications of his imagination and ingenuity are manifold. They expand beyond just the iDevices we hold in our hands. And they will continue to unfold far into the future. While typically used more in reference to ecology, but relevant here no less, one of the definitions of pioneer is "an organism that successfully establishes itself in a barren area, thus starting an ecological cycle of life." Like a true pioneer, Mr. Jobs took his imagination to a place that didn't even exist yet. The technologies that were born from his inspiration took on a life of their own. They have given way to even more new ideas and possibilities that would have gone unrealized without his vision and perseverance. As a fun reminder of just how visionary Mr. Jobs was, look back again at this Apple Macintosh commercial from 1984. Mr. Jobs embodied everything that is best about our inherent pioneering spirit. It is that spirit that stands the best chance of once again changing our economic tide back towards prosperity. Here's to all the pioneers out there, particularly those with the good sense to stay foolish and stay hungry as they blaze new trails. Where is Helicopter Ben when you need him? With the Federal Reserve low on stimulus bullets, our Fed Chairman has called on Washington to get its act together. The Tea Party couldn't be happier. At the same time, a number of economists, including Bernanke, suggest any near term cutbacks in Washington spending could throw us into a deep recession since we have no organic economic engine to take up the slack. One institutional investor recently suggested that the government austerity movement is like trying to put an anorexic person on a diet. What good would that do? How confusing is it that we're overspending, but we can't cut back because our economy depends on overspending. So here we are in hurricane season with numerous economic tropical storms circling our perimeter. Will we be able to avoid economic natural disaster? It seems we need a deft and delicate effort to keep us from experiencing another recession; economic hurricane season could be around for many more months. The European storm of financial contagion seems to be gathering strength by the day. In the U.S., the self-preservation instincts of politicians have caused most in Washington to give up on economic policy and turn their focus to the 2012 elections. Could be time to batten the hatches, board up the windows and stock up on supplies just in case. Each time we reach the edge of economic abyss, someone seems to come to the rescue. The U.K. Fed just announced more quantitative easing. The ECB also just announced another move to support E.U. banking. During the Asian crisis in the late 1990s, the Hong Kong Fed went as far as buying public equities to prop up their market. So maybe our Fed still has a bullet or two left in the barrel, but the mere need to use them would suggest we still haven't found an organic economic growth engine. Does the term Developed Markets suggest we are mature and responsible, or old, cranky and feeble? Layoffs on Wall Street have begun again. Profits are down. Profit guidance is moving lower. Regulatory pressure is building while the Wall Street protestors are gaining national attention. Our financial services industry appears to be in for some stormy weather. With bank stocks down, the equity component of banker incentive compensation is looking more and more like less and less. And with the IPO market closing, M&A activity in retreat and trading volumes down, profits that support bonuses will slide until we see some type of economic turnaround. The last few days of economic data have provided some respite, so maybe we'll see a stronger Q4 from Wall Street. One way or another, it looks as though we are back on path towards a new Glass-Steagall world, where bank lending and investment banking would separate once again. The too big to fail are just too big. During the time it takes to restructure Wall Street, we will likely see job market chaos; but eventually, independent sell side firms will likely again lead the securities industry. The old Wall Street partnership model looks likely to return. It's the too big to fail sell side firms that might have the least sustainability. Small advisory boutiques with low fixed costs are a good place to weather any structural storm that reaches Wall Street's shores. Compensation at these firms is eat what you kill, so personal earnings expectations might need to be modest. The private equity community always suffers in economic contractions. The nature of private equity is to seek maximum leverage on their portfolio company's balance sheets in order to maximize return on equity. But highly leveraged companies quickly falter in a contracting economy. You can't grow margins and cash flow when revenues are falling. Expect hiring to moderate at both private equity firms and their portfolio companies, should our economy falter. With equity markets and commodities down across the globe and little room for fixed income appreciation, hedge funds are likely finding a tough investing environment. Shrinking assets under management doesn't exactly inspire more hiring. Let's see what recent monetary stimulus measures in the U.K., Europe and the U.S. do to investment markets. Large corporations flush with cash need to put that money somewhere, so highly strategic M&A will likely continue. But if we go into recession, all bets are off until the market can better understand our economic floor and potential ceiling. Recessions reduce revenue growth or just revenue everywhere, which of course doesn't inspire job growth. Should we double dip, we could see some job opportunity by way of reorganization and restructuring. Contract and consulting opportunities will also open up as employers hedge their bets by hiring more temporary project-oriented people. With professional baseball now in the playoffs, it pays to consider the arduous journey to get there. Teams play 162 games over the course of spring and summer, a grueling schedule of physical and mental challenge. Being in first place at the All Star break may feel good, but certainly not nearly as good as making the playoffs or winning the World Series. Life and careers really play on the same kind of schedule. A "career season" is very long, with ups and downs throughout, both personal and from the business cycle. If by good fortune we find ourselves on top of the world early in our careers, then it pays to keep a modest and humble perspective. If things seem too good to be true, in short order we may find out they really were. One step at a time, one project at a time, one good deed at a time seems the best approach. And showing up for practice early and staying late may be necessary to keep our skills sharp. In the earliest stages of our careers, a quick start could lead to overconfidence, which makes us susceptible to larger than expected setbacks. Few are prepared to handle great success at a young age. Keep in mind, though, that even if one is late in the season of his career, it is never too late to make a run for the top. Just follow the coach's advice: Strive to improve every day, be patient and persistent, and do good things. I will never forget my very first private equity client, Gordon Cain. Mr. Cain spent a career in Big Corporate America. But then in 1982 and at 70-years-young, he started a private equity firm, The Sterling Group, and knocked it out of the park. Never give up. Those who die with the plow firmly grasped in their hands have led an honorable and inspiring life. Maybe it was a cranky uncle, but we've all heard someone lament that there are just too many lawyers in the world, and they're only growing in number. While it's impossible to measure the influence of any one lawyer, we actually became curious: Are we getting more and more lawyers? Or is it just a common misconception? Turns out, the number of graduates from law school per 10,000 U.S. citizens has been more or less stable for decades. 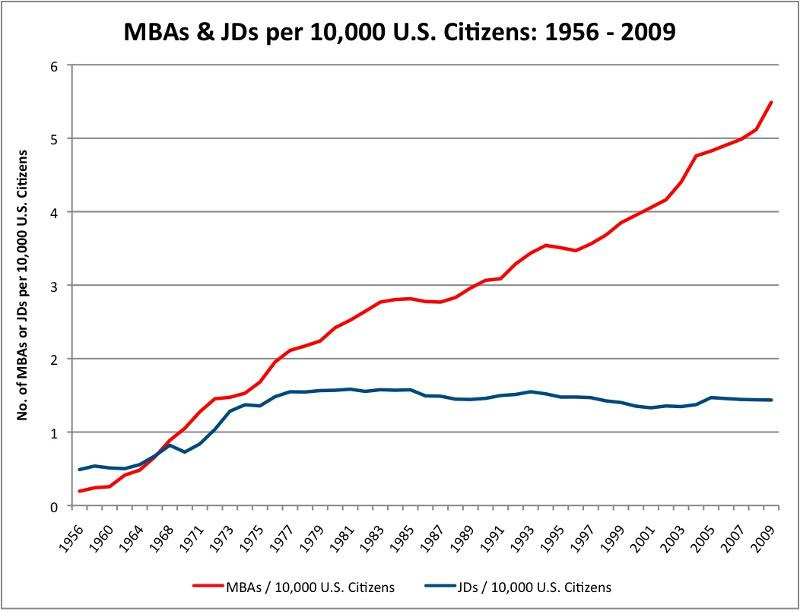 While the number of business school graduates per 10,000 U.S. citizens has far outpaced JD grads for decades, and continues to climb. Source: National Center for Education Statistics and U.S. Census Bureau. In the age of terror and heated economic protests, could it really be that we are living in the most peaceful moment in human history? According to pop-psychologist Steven Pinker, we are, as outlined in his new book called The Better Angels of Our Nature. One theory behind this unprecedented widespread peace is technology's ability to allow us to engage instantaneously with people and cultures all over the globe, which has served to demystify our differences and bridge divides, engendering empathy. One of the definitions of pioneer is "a group of foot soldiers detailed to make roads, dig entrenchments, etc., in advance of the main body." An apt description for those pioneers like Steve Jobs, whose technologies, among infinite other benefits, played a role in leading the way down a path for us to see the world more and more in terms of common, not disparate, ground. The bear market is back. Oh wait, is it? Europe teeters on the brink of collapse. Or does it? Instability seems king these days. Throw in an ever connected, ever complicated global market place and new regulations, and the search for a sustainable new banking paradigm seems daunting. In an attempt to find the most stable path forward, McKinsey sets out to answer the ultimate question: How can banks shrink balance sheets, cut costs, and increase revenues so that investors will once again feel comfortable putting capital back in the banking system? Finally, a kind of contagion we can get behind. With that other contagion - economic contagion - startling markets and businesses, leaders must channel their own fears to communicate calm through confident leadership that inspires their employees to move their own focus away from possible threats to the important tasks at hand. This HBR article outlines tips for leaders to manage their own stresses and transform them into a commitment to the company's mission and larger meaning. When done well, this can spread throughout entire companies and pay dividends. Quiet confidence and common sense leadership create a contagion of success. Business Insider takes a look at the most trailblazing, influential and game-changing CEOs of the past 20 years. This article's author goes against the grain of today's more touchy-feely management trends. At face value, some of his tips might feel a little harsh (e.g. don't welcome a new employee to the "family"). But the crux of his advice aims to put the emphasis back on motivating a new employee to earn his or her voice, sense of company belonging, and freedom to contribute ideas and suggestions, among other awarded "perks." In the era of entitlement, he just might be onto something. Might we see a shift back to winning trophies for achievement rather than just participation? The weak economy has caused salaries to drop, but many companies have dropped them simply because they can. However, there are risks to taking advantage of a weak employment situation and choosing not to pay people a market salary. The most obvious being that underpaid employees will likely leave as soon as something better comes along. If the objective is to keep an employee for the long haul, a strategy is to pay them their worth where the budget allows. In today's world where we must manage costs as tightly as possible, it's important to remember that people really are the lifeblood of every business.